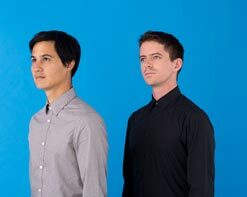 For the Dodos “the best time to make a record is right after you’ve finished one” says vocalist and guitarist Meric Long. “There were things I didn’t want to forget, sounds that we had just scratched the surface of making that record that I wanted to capitalize on. Songs came together easily, there was not a lot of questioning, just moving ahead with the feeling that we were on the right track. We were freed up to do whatever came naturally” says Long. Individ’s first single “Competition” is a shining example of this proclivity, built on dueling guitar lines that overlap above and below a persistent drum beat as Long’s assured vocals soar above it all. We’re all very excited to be continuing to spread the word about The Dodos and their new album Individ, out now on Polyvinyl Records. We’d love to hook you up with a copy or get you out to a show when they hit your market this spring, so get in touch with Andy Gesner and the HIP Video Promo team at (732)-613-1779 or email at info@HIPVideoPromo.com . You can also visit www.PolyvinylRecords.com or www.DodosMusic.net for more info on The Dodos.